The Du Paquier porcelain factory was founded in 1719 by the entrepreneurial Dutchman Claude Innocentius du Paquier. Based in Vienna, Du Paquier was the second European factory after Meissen to produce hard-paste porcelain. 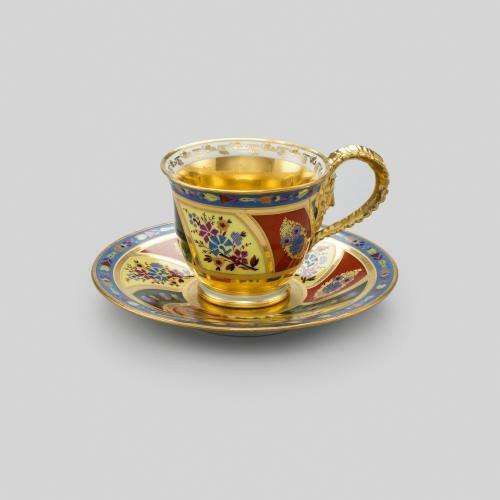 Du Paquier succeeded in luring a few employees from Meissen, including a kilnmaster, and the factory became renowned for its rich decoration and scenery. Du Paquier produced a range of tablewares, decorative vases and small-scale sculpture that became extremely popular with the Habsburg court and Austrian nobility. 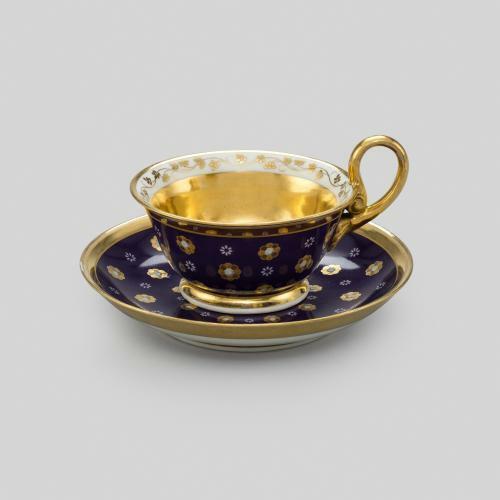 This tea bowl and saucer was enamelled by the German hausmaler F.J. Ferner, who decorated both pieces with depictions of the life of St John the Baptist. The tea bowl depicts St John wandering the wilderness with two angels beneath the caption ‘Angelica Societas Joannis’, while the saucer depicts St John baptising Christ in Jordan.